I know this doesn't have anything to do with Barbie or recipes, but I thought that since it involved crafting, I would put it here. I spent many hours searching the Internet for some super hero capes for a dress-up birthday party. The least expensive I could find were $6.00 each. I also stumbled across for "mini super hero capes craft kit at S&S Worldwide at twelve for $32.99. I have no idea from what these are made, but I'm guessing paper. I decided to troll through Dollar Tree to see what they had. I found these plastic tablecloths with a thin fabric web backing. I purchased 6 cloths for a total of $6.00...the joy of the dollar store. I was hoping the backing would be substantial enough to use just one layer of tablecloth, but it wasn't. I cut out a simple pattern and placed the webbing sides together and stitched around the outside edge. You could use a spray adhesive to join if you fear the sewing machine. Then I attached a hook and loop tape fastener to each cape front. The entire sewing and trimming process took less than 15 minutes per cape. I found these in green, red and blue in the housewares area. Do NOT use the thin un-backed plastic cloths on the party supply aisle. Open the table cloth so the length is folded over upon itself, making it half the size. Then fold this in half, from left to right. Then fold it in half, again. Now you have 8 layers of cloth. Make sure that the cloth is fairly smooth and the folds along the left edge are lined up. You can find a free pattern on the Internet, or make your own. Mine started at 7-inches at the neck edge and slowly increased to 10-inches at the bottom. the overall length from the center back of the neck was 25-inches. These measurements should fit 4-7 year-olds. Since you are putting this pattern on a fold, the finished bottom edge will measure 20-inches. Simply sew (or spray adhesive) two capes with the WRONG sides together. I stitched about 1/4-inch from the edge and then trimmed to 1/8 -inch. The "fabric" is thin enough for you to see if you are catching both sides of the cape in the stitching. This is not a precision project. If you have to increase the width of your seam to "catch" the underside fabric, it won't make any difference and the excess will be removed when you trim. Just be careful with the scissors...this stuff is thin and cuts just like paper. Also, you cannot rip out stitches without tearing this stuff. Make sure your machine is working on a bit of leftover tablecloth before you try it on the cape. I just used a regular needle, thread and stitch length and tension. It sews easily. I added colored hook and loop tape on the underside of the top flap and the upper side of the bottom flap. I found colored "Velcro" at Hobby Lobby made by Sew Ology. Attach this well, it will get tugged on a lot! These capes fold into nothing and can be easily store or transported. Kids can decorate the capes with markers and glue things on them, like stickers, but YOU CANNOT IRON THIS MATERIAL. I think these are pretty sturdy, but certainly not on the par with real fabric capes. If you need a ton of cheap super hero capes, this is the way to go. If you are feeling creative, you can trim the seams with pinking shears or use decorative-edged scissors. If red velvet cake is not your thing, I think you will appreciate this rehab recipe. I know this is not the traditional recipe, but I think regular Red Velvet Cake doesn’t have much flavor. I did retain the original frosting which is not the cream cheese variety one so often sees. Before you start, don your disposable gloves unless you want to be sporting bright red hands. This batter is a menace! Process preserves in blender until smooth. Set aside. Cream the ingredients until light and fluffy. Add eggs and beat 3 minutes. Continue beating until smooth. Divide batter into 3 baby Bundt pans that are well greased. Bake at 350° for 45 minutes. Cool five minutes and remove from pan to cool. Stir until melted and allow to cool. Beat butter, sugar and vanilla and add to cooled milk mixture. Beat until smooth and spread over the cooled cakes. Gidget is taking an extra long lunch hour so that she can attend an awards ceremony honoring her dad, Jim. He is receiving a citation from the police department for meritorious service and bravery while rescuing another fallen police officer. Don't make the mistake of calling police officers "pigs" in front of Gidget. I think I could live on these. They are the all time favorite for me and my husband. I have eliminated the bottom crust, so I'm sure they are much lower in calories...and all those vegetables are good for you! Melt the butter in a saucepan, stir in the flour and cook, stirring, for 2 minutes. Slowly add the broth, cream, pepper, pepper flakes and salt to taste. Cook for 5 minutes, until thickened and smooth. Put the chicken pieces in a 9x13 casserole, cover with sauce, and stir in the vegetables. enough overhang so that the edges can be crimped. Cut vents in the crust to allow the steam to escape. Bake for 25-30 minutes or until the crust is nicely browned. This will also work if you want to make mini pies. You will just need several additional pie cursts.Bake individual pies at 375˚ for 20-25 minutes. If frozen bake 45 minutes. As busy as she is, Maryann is taking time to deliver a pot pie to her new neighbors. Glad I have a few mini pies in the freezer. Just reading the recipe makes me hungry! While it is still chilly and we are not too far away from the holiday season, it is a great time to give gingerbread one last fling. Gingerbread is… well, plain, but this upside down cake version really picks up the flavors a notch. Mix the ingredients together and pour into 9x13 pan. Cream the sugar and molasses. Add oil, butter, buttermilk, eggs and vanilla. Bake in 9 x13 pan at 325° for 45-50 minutes. Let rest five minutes and invert onto flat plate or parchment lined cookie sheet. It seems that everyone in the world adores cheesecake, except me. I had to grin and bear it when my daughter wanted cheesecake at her rehearsal dinner. On the plus side, it has inspired me to work really hard to find a cheesecake I can call "dessert." My neighbor, Amy, said it was the best cheesecake she ever had. I don't know how much cheesecake she has eaten. In any case, this seems to be a step up from your average fare. It is a great make-ahead dessert, especially for your Valentine. As part of my plan to conquer desserts I despise, I have taken on the lowly cheesecake and attempted to raise it to new heights and caloric levels. I admit it is very good and extremely rich. Cut this into tiny slices. If I can’t inspire you to make pralines, just buy some and add to the recipe at the appropriate moment. In an 8 cup glass bowl, mix ingredients and cook in microwave for 9-10 minutes. The mixture will be thick and bubbling. Stir in butter and vanilla. Stir until the mixture gets creamy and starts to cool. Add pecans. Stir and drop by tablespoonfuls on parchment paper. Allow to cool or put in freezer to speed up the process. You will use about half of the pralines for this recipe. Cut into bite-size chunks. Reserve ½ cup for swirl and use about 1 cup to cover the chocolate layer. In the microwave, heat chocolate for 30 seconds and stir until melted. Set aside to cool. until fluffy. Add eggs, one at a time. Spread into the bottom of a greased and parchment lined 10 inch springform pan. Add crumbled pralines. Set aside. Add eggs one at a time, just beating to incorporate. Reserve one cup of the mixture and place the rest on top of the praline layer. In the microwave, heat chocolate for 45 seconds and stir until melted. Set aside to cool. Drop by spoonfuls on top of cheesecake layer and swirl with knife. Be careful not to disturb the bottom two layers. Set pan on a cookie sheet. Bake at 350° for 10 minutes, reduce heat to 325° and bake for 85 minutes more. Lay foil over the top if it begins to brown. The cheesecake should seem solid except for about a 2 inch radius in the center. It will keep cooking when removed from oven. Cool for 60 minutes, then refrigerate overnight. Remove from pan by running a knife around the inside edge of the pan and then releasing the clasp on the springform pan. Remove parchment paper. Cook in the microwave for 1 minute. Stir until smooth. Allow to cool slightly and serve over the cheesecake or use to decorate the plate. Maryann poses for photographers just before her voice recital. Let's get in the Mardi Gras spirit with a little something French. Veronica is checking out New Orleans for her travel agency. Will she find love or a plot for her latest manuscript? This cake sags in the middle and is perfect for those seeking chocolate, not perfection. beat until they hold their shape. Fold egg whites into chocolate mixture. Butter sides of 8 inch springform pan and put parchment paper in bottom. Bake 18 minutes at 425°. Let cool and refrigerate overnight. Remove from pan. It looks funny and dips in the center. Fill cavity with whipped cream. I am so sick of all those ads for diet pills. If there was anything that truly helped one lose weight in such a miraculous way, wouldn't it be touted on every news program and by the medical profession? If you're thinking you can sprinkle SENSA on your food and become thin overnight, just remember one of its ingredients is sugar. Why waste your time on all this pill business? Take some responsibility for yourself. Use a smaller plate, don't have seconds and eat a small dessert at lunch and dinner. I read somewhere that having a sweet after eating signals to your body that food intake is over! I love that idea. Photo from Internet...didn't have time to bake today. 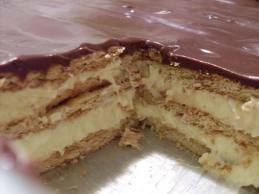 ﻿ If you crave chocolate eclairs, you will find this a tasty substitute. I really like this dessert, but the trick is remembering to make it the day before you want to eat it. Place half of the custard on top of graham cracker crust. Beat until smooth and spread over custard layer. Top with another layer of graham crackers, custard and icing. Chill overnight. Could Annette look any sweeter in her chocolate daisy dress? No wonder salesmen come early and linger after their appointments with her in the reception area. I'd tell her she looked soigne, but she wouldn't know what it means. "Swan, what?" 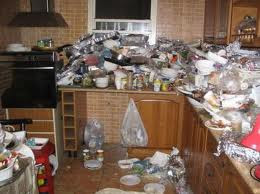 Does you kitchen look like this? Time for intervention! Here are some items that will make you life much easier and maybe your kitchen, cleaner. The Pyrex pie pan with edge grips. This allows you to retrieve a pie from the over without smashing the sides of the pie crust. 12x18x2 metal Wilton pan. You can bake a batch of my Big Brownies, a huge lasagna, Texas Trash or use this pan for a water bath for custards and bread puddings. It is gi-normous! Kitchen-Aid mini chopper. I use this to chop nuts, fruit and chocolate, puree small amounts of a product and even to chop ham or chicken. Mini spatulas. These have a billion uses from cleaning off beater blades to scraping stuff out of small jars. Stir until smooth. Pour over bottom layer and bake at 350˚ for 35-40 minutes. Serve with hot fudge sauce. Ginger is dog sitting for Gidget's dog, Xavier Cugat. Ginger is taking the turtle cake to work today. The office is celebrating the fifth anniversary of Hip Chic magazine. Tonight she will be celebrating with her latest conquest, Tyler Rathbone...dinner reservations in Las Vegas. In my never ending quest for unusual, I was determined to combine some odd ingredients and produce a whopping good cake. Bake at 350° in a greased full-sized 9x13 pan for 43 minutes. Let set overnight and serve. This is good with ice cream and whipped cream, but it really doesn’t need anything to enhance it. It is moist and delicious. Gidget's dress reminds me of this great cake...chocolate and cherries in a crazy combination.